Nicholas Copernicus (1473-1543) postulated the Sun as the center of the Universe in his De Revolutionibus Orbium Coelestium (1543). Born in Torun, Poland, Copernicus first studied astronomy and astrology at the University of Cracow (1491-94). Later, he matriculated in 1496 in the University of Bologna, where he assisted Domenico Maria the Ferrarese of Novara (1454-1504), professor of mathematics and astrology and also the official compiler of prognostications for the university. After briefly returning to Frombork, Copernicus studied medicine at the University of Padua (1501-3) and then moved on to the University of Ferrara where he obtained a doctorate in Canon Law (1503). He then returned to Varmia, where he was based for the rest of his life. He acted as medical advisor and secretary to his uncle, a church bishop at Heilsberg, and was later heavily involved with the administrative tasks in the diocese of Frombork. In 1514, the Lateran Council sought Copernicus's opinion on calendar reform. Around the same time, he began to circulate in manuscript the 'Commentariolus' (A Brief Description), in which he criticised then prevalent Ptolemaic system for not adhering to the principle of uniform circular motions and offered instead his own system in which the earth and all the other planets rotate around the sun. By the 1530s, Copernicus's reputation as a skilled mathematician had even reached the ears of the Pope. A professor of mathematics at the University of Wittenberg, Georg Joachim Rheticus (1514-1574) who was on a tour of visiting distinguished scholars, visited Copernicus in 1539. Copernicus shared his ideas with him, and Rheticus published the Narratio Prima (First Report on the Books of Revolution) in 1540 at Gdansk, in which he reported Copernicus' heliostatic theory in an astrological framework: the changing fortunes of the kingdom of the world, according to Rheticus, depended on the changing eccentricity of the sun. Following the favourable reception of the Narratio Prima, Rheticus persuaded Copernicus to publish a full account. This, of course, became the De Revolutionibus Orbium Coelestium (On the Revolutions of the Heavenly Spheres), published in March 1543 at Nuremberg. Copernicus died two months later. In his De Revolutionibus, Copernicus ordered the planets and proposed the view that the universe is centered on Sol (our sun) versus Terra (our Earth) which was commonly believed to be the center of the universe. Thus, Copernicus is often incorrectly portrayed as a controversial figure who advocated a heliocentric system for the express purpose of overthrowing existing systems and institutions. In fact, his monumental work, the De Revolutionibus, is far from a revolutionary manifesto for modern astronomy. The work follows closely the structure of Ptolemy's Almagest, it is based on parameters and data from Ptolemy, and his dedication to the Pope is written in a fashionable style. He does indeed provide a model of the universe in which the earth and all the other planets orbit around the sun and the earth acquired a daily rotation, but the sun itself was not quite in the center of that universe. He established the order of planets and devised a system which accounted for the movements of planets without equants, but he was motivated by the desire to establish uniform circular motion, itself a classical ideal. Copernicus certainly believed that this was the true system of the physical universe, but this conviction was not shared widely by his peers for contemporary reasons. Copernicus then went on to briefly discuss the following cosmological topics. Like Ptolemy, he only presented a brief discussion of each point. The universe is spherical;The earth is also spherical;The earth forms a single sphere with water;The motion of the heavenly bodies is uniform, eternal, and circular or compounded of circular motions;Does the earth have a circular motion? What is its position? ;The immensity of the heavens compared to the size of the earth;Why the ancients thought the earth was at rest at the middle of the universe as its centre;The inadequacy of the previous arguments and a refutation;Can several motions be attributed to the earth? The centre of the universe. In this section, Copernicus stated that 'since nothing prevents the earth from moving, I suggest that we should now consider also whether several motions suit it, so that it can be regarded as one of the planets. For, it is not the centre of all the revolutions'. Following a short consideration of the questions, he concludes that 'it will be realised that the sun occupies the middle of the universe', explaining that 'all these facts are disclosed to us by the principle governing the order in which the planets follow one another, and by the harmony of the entire universe, if only we look at the matter, as the saying goes, with both eyes'. Finally, the Sun resides in the centre of the universe. He admitted that 'all these statements are difficult and almost inconceivable, being of course opposed to the beliefs of many people'. But he hoped that 'as we proceed, with God's help I shall make them clearer than sunlight, at any rate to those who are not unacquainted with the science of astronomy'.Copernicus went on to elaborate his cosmological views:At rest in the middle of everything is the sun. Nicholas Copernicus (1473-1543) postulated the Sun as the center of the Universe. Born in Torun, Poland, Copernicus first studied astronomy and astrology at the University of Cracow (1491-94). After considerable more study in mathematics, medicine and law; he returned home for an extremely busy life. 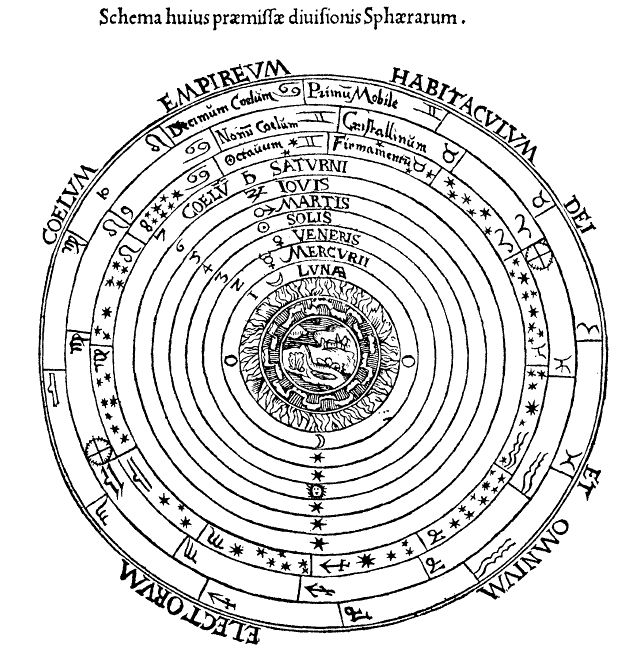 In 1514, he began to circulate in manuscript the 'Commentariolus' (A Brief Description), in which he criticised then prevalent Ptolemaic system for not adhering to the principle of uniform circular motions and offered instead his own system in which the earth and all the other planets rotate around the sun. By the 1530s, Copernicus's reputation as a skilled mathematician had even reached the ears of the Pope. Thus, the distinguished Professor Georg Joachim Rheticus (1514-1574), University of Wittenburg, included Copernicus on a tour of distinguished scholars and visited Copernicus in 1539. Thus, Rheticus reported Copernicus' heliostatic theory in his subsequent book, Narratio Prima (First Report on the Books of Revolution) in 1540 at Gdansk. Following the favourable reception of the Narratio Prima, Rheticus persuaded Copernicus to publish a full account. This became the De Revolutionibus Orbium Coelestium. Copernicus ordered the planets and proposed the universe to be centered on Sol (our sun) versus Terra (our Earth) then considered as the center of the universe. Thus, Copernicus is often incorrectly portrayed as a controversial figure who advocated a heliocentric system for the express purpose of overthrowing existing systems and institutions. In fact, his monumental work follows parameters and data from Ptolemy, and it's even dedicated to the Pope in a fashionable style. He presents a model in which the earth rotates daily and orbits the sun, but the sun itself was not quite in the center of the universe. He established the order of planets and devised a system which accounted for the movements of planets without equants, but he was motivated by the desire to establish uniform circular motion, itself a classical ideal. Copernicus certainly believed that this was the true system of the physical universe, but this conviction was not shared widely by his peers for contemporary reasons. He admitted: 'all these statements are difficult and almost inconceivable, being of course opposed to the beliefs of many people'. He hoped: 'as we proceed, with God's help I shall make them clearer than sunlight, at any rate to those who are not unacquainted with the science of astronomy'. Copernicus introduced a new cosmological view: At rest in the middle of everything is the sun.